I haven't ever had a private selection of Russel's Reserve before. I've had a private selection of Kentucky Spirit, but for whatever reason I never grabbed one of these. Even this one was a Christmas gift from my wife. I don't know why, but I just never grabbed one off the shelf whenever I saw one. That has likely changed going forward, though. First of all, as I've said repeatedly in this blog, I love free whiskey! This is no exception. However, I always do my best to not let that skew my reviews. The nose was certainly sweeter than other Wild Turkey products I've had. It almost had a maple syrup and vanilla quality to it, but without being cloyingly sweet if that makes sense. Perhaps it's because that sweet quality on the nose was balanced out a bit by some dark cherry tartness. Also, I've always found Wild Turkey products to have a certain funk to them, something I've always noticed on the nose. Not the case here. The flavor had a sweetness to match the nose. It wasn't so maple syrup flavored, but rather a cinnamon and brown sugar flavor. It also had a slight chocolate flavor that seemed to add a bit of smoothness to round out that dessert-like profile. This was one of those whiskeys where I noticed something different with nearly every pour. A couple times I poured a glass and I got a distinct sugar cookie flavor. As I thought about it more, I decided that it was more accurately a snicker-doodle flavor, like a sugar cookie but with some cinnamon and a slight bit of tang to it. I also felt at points that it had a spiced baked apple pie note going on. The flavor was fleeting, but it was distinct and unavoidable. Even the final pours of this had a bit of a maraschino cherry flavor to them. They were sweet, but always had that bite to them to again balance out that flavor. While this bottle didn't exactly blow me away, what it did provide was a lot of character, complexity, and a veritable cornucopia of flavors that seemed to change with each pour. In that sense, this was one of the more fun bottles I've enjoyed in quite some time. I can't tell you the last time I got snicker-doodle, that specific flavor, in a whiskey, but here it was. 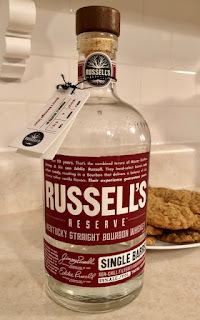 This was a very good bottle, and I will certainly make it a point to try other private select Russel's Reserve going forward. After all, I've never really had any good reason not to in the first place.